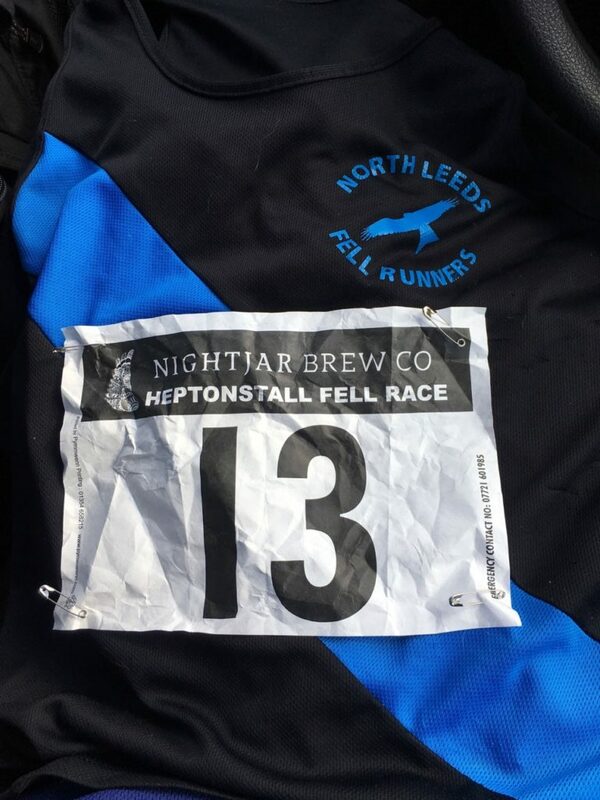 This was my third year of running Heptonstall Fell Race. The first year it rained all the way round. The second year I got lost. And here I am again on the cobblestones, listening to a kindly vicar say actually very sensible Christian things (I am an atheist but think there is a lot of sense in the Bible). He said he had tried to find quotes appropriate to what we were about to do, so he wished us perserverance, and also — though I forget the exact phrasing — to go forth and find fellowship while running. It was nice, and I was grateful for it, because I was dreading the race. My nerves were all over the place, and they weren’t calmed by me setting off for the toilets 15 minutes before the start and realising I had forgotten to put in my contact lens. I would still have been able to see, but my lens helps me pick out tree roots and rocks and I knew there would be plenty of both on the route. So I had to run quarter of a mile up the road to the field of car parking, put in my lens in a state of panic, which is the state in which it usually takes me 10 minutes and several lenses to get it right, then run down to the start and hope I didn’t need the toilet again. What was I nervous about? I’d run the Yorkshire vets race the day before. (Yorkshire Veterans Athletics Association, not animal doctors.) I don’t normally do double-header weekends, but I hadn’t done many vets races last season, and they are friendly and fun. They are also oddly encouraging because when you are passed by people 20 years older than you (you know this because you wear your age category on your back), it is inspiring, not demoralising. 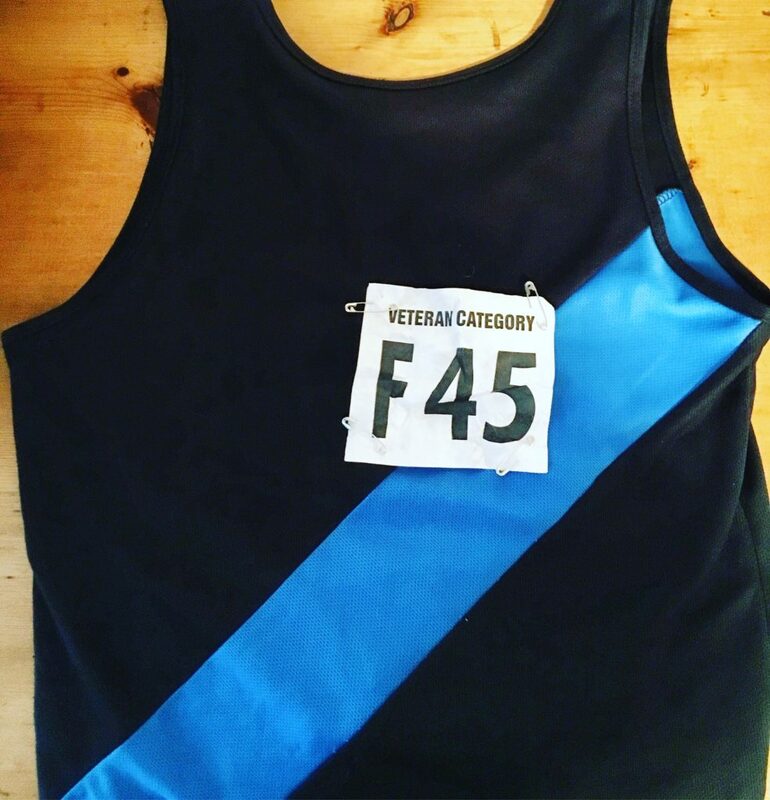 It’s my last year in the F45 category, and it’s going to get no easier in F50 because there’s some fiercely good over-50s. Also inspiring. The race was only five miles long, and it was around Middleton Park, which is a nice wooded area of Leeds. But I found it very tough. I ran most of the hills, but still, I had heavy legs, and I was slower than I’d expected. I can explain some of that. As part of HRT, I have to take progesterone for 10 days a month. This is the progesterone time, and it always makes me depressed, dopey, bloated and ravenous. Taking progesterone for 10 days is like being prescribed PMT for ten days. Fun. For the first time I’d noticed that it also weakened my bladder. I’ve been good at doing pelvic floor exercises, and for the last few weeks have actually managed to run without the usual stress incontinence (which I wrote about here for the Guardian, and will be writing about again soon). Unless you have poor bladder control, you won’t know the relief of being able to run without worrying about smelling or showing that you’ve peed yourself. I had got used to it being better, and it had felt great. So last week when suddenly I seemed to have no control again, I couldn’t understand it, until I googled progesterone. It is a muscle relaxant that also relaxes pelvic floor muscles that hold the bladder in check no matter how much stronger those pelvic floor muscles have become with your assiduous daily exercising of them. Great. So I wasn’t looking forward to that. I was worried I’d feel like as sluggish as I had at the vets. And I had usual pre-race nerves too. In short, I was really good company. At registration, the women handing out the numbers complimented me on my handwriting (I was probably the only person who’d filled out the FRA form with a calligraphy pen) then asked if I minded having number 13. I said no, because how could things go worse than last year? There were lots of people I knew also doing the race, and we gathered together at the start. Amongst them were Louise and Izzy, who like me have been getting run coaching for the last eight weeks from FRB, who is now fully qualified as a coach and has set up as Run Brave coaching (website to come, Facebook page here). We have all noticed major improvements in form and understanding, and we have all been getting really good race times. I never finished the post I wrote about Rombald Stride in February. 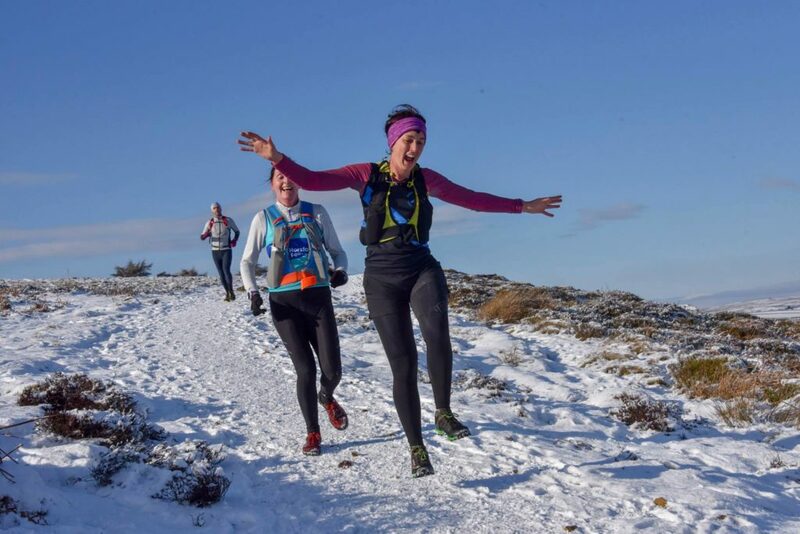 I ran it with Louise, and felt great, and ran all the runnable bits, which doesn’t normally happen, and got a 20 minute PB over a 23 mile race. This was going to be OK. I felt good. I felt strong. 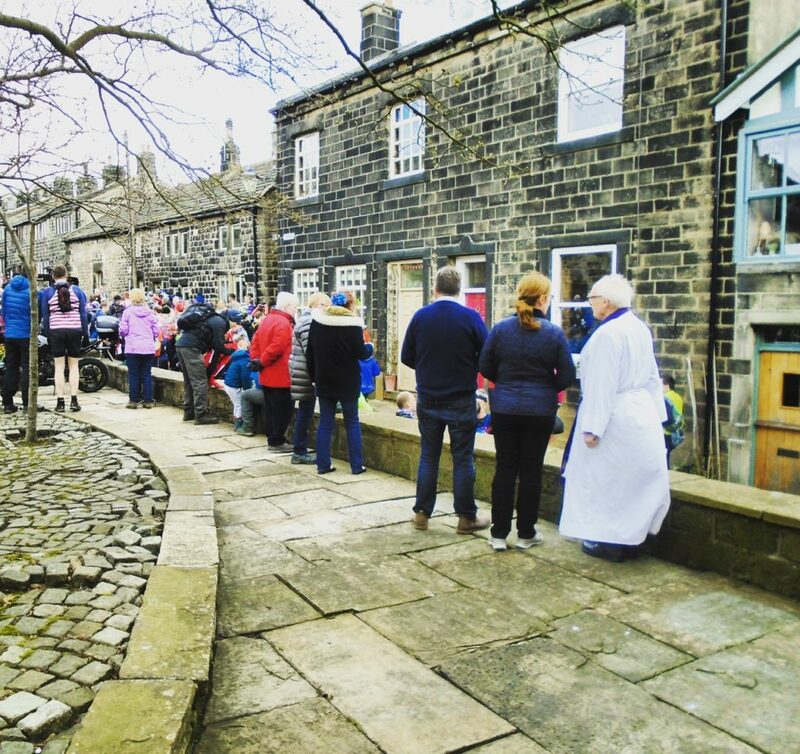 Heptonstall has cut-offs, a phrase I usually dread, but they are more generous than the Three Peaks ones, so I put them out of my head and just resolved to do my best. 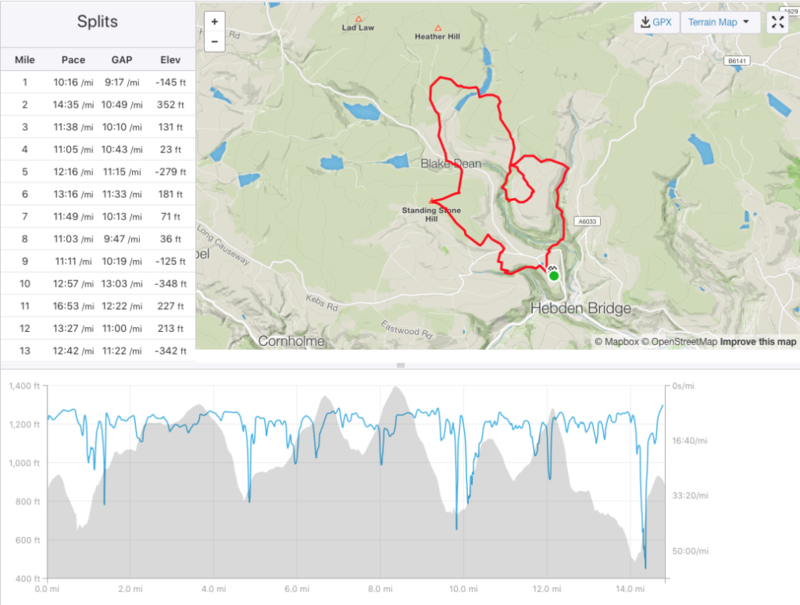 FRB, trying to calm me down before the race, when I had made a comment yet again about getting lost, advised me to keep my map handy and look at it whenever I was walking uphill, and locate myself on it by remembering the checkpoints. Of course I forgot to take my map out of my pack. And for the first three checkpoints, there were plenty of people around, and throughout the race, an extremely generous amount of flags. I knew though that things would get stretched out at CP3. 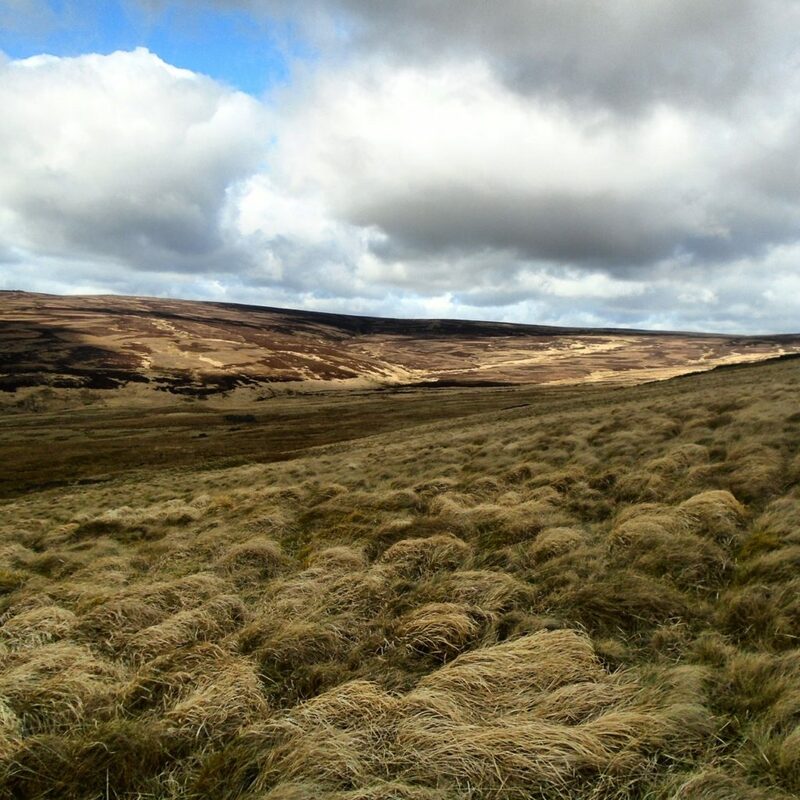 Before that, there was what felt like a very very long nav section over open moorland. It was flat/undulating, but the bogs sapped the legs, and we were only a couple of miles in. It felt like it would never stop. I can’t remember the next stretch, the time passed, the moor rose up to meet me, and then we were descending to the beck, and up a steep road to a steep hill. 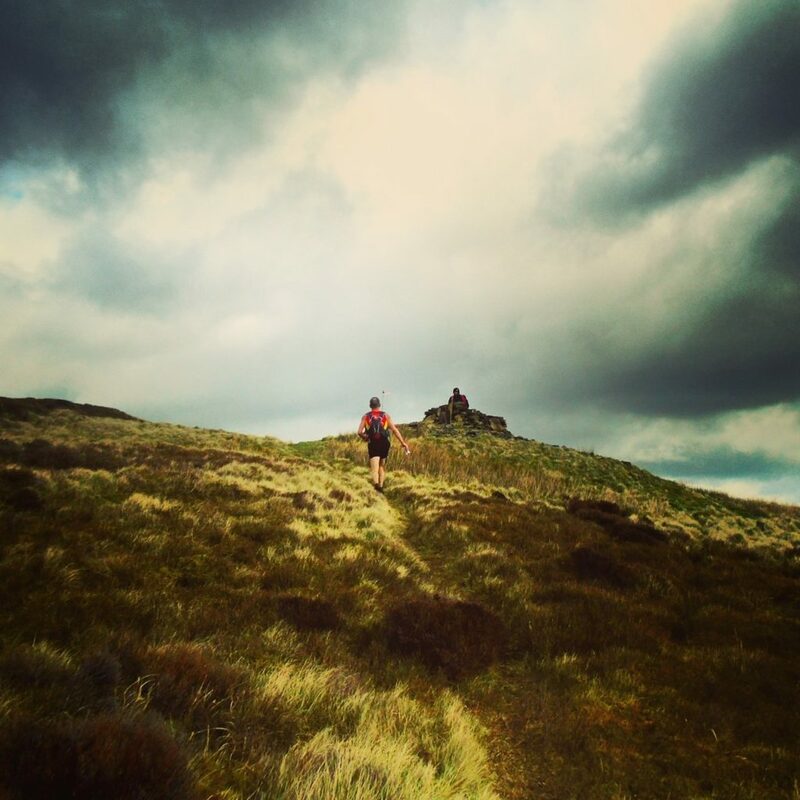 I knew the road because it’s part of the Widdop fell race, so I steeled myself to run up it. 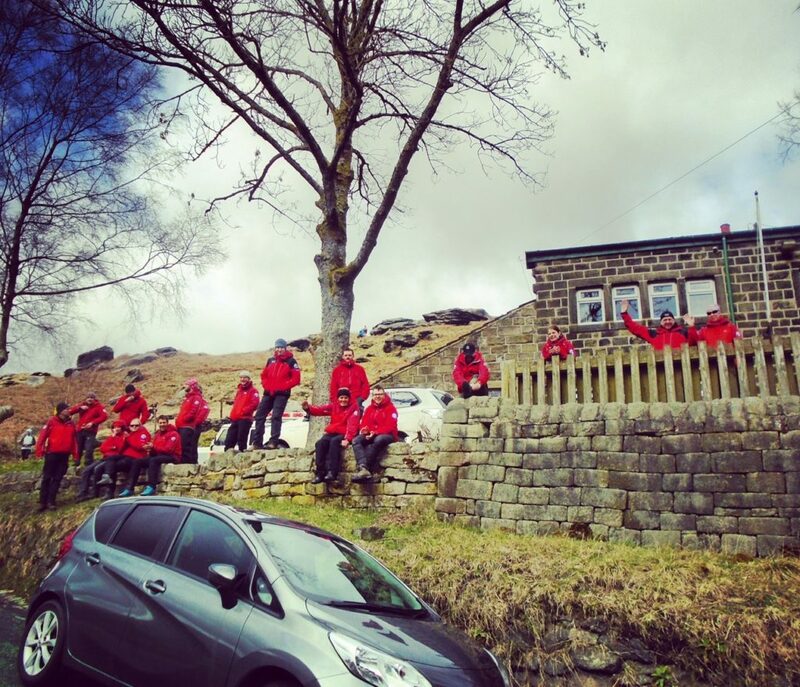 I turned the corner and there, like a vision, was a mass of Calder Valley Search and Rescue Team, red-dressed angels perched on a wall. They were fantastic. They are fantastic anyway because of what they do, but here they were cheering everyone and being a big puff of sheer goodwill, and I thought they were great. Up a very steep bank, onwards, and then I can’t remember the next stretch until the reservoir, and I remembered to cut down through the grass, because I’d gone wrong there the first year, and then there was a long long track up to High Rakes, and I ran and kept running, and still felt good. I had the usual picnic with me, and I made sure to fuel. But actually I didn’t have much over three hours: a mouthful of raisins, a gel, a small piece of Kendal mint-cake and a jelly-baby. Ahead of me was Aileen, a really impressive 60+ runner from Stainland Lions. She is super steady, so I followed her. FRB had asked me what my tactics were, and I had come up with “not get lost” but look, here I was being tactical. As in, hang on to Aileen. Later, we got to the dell where I had got horribly lost the year before. There was no chance of that this year, because I had learned during the recce where the route went, and even if I failed to turn on the right bridge, as I’d done last year, I knew how to find the route and most importantly where it was. We’d only been about 100 metres away from it the year before. There was also no chance because the marshals were on the crucial bridge this year. Some of the marshals were scouts — thank you scouts — and one of them was sitting on a rock with a clipboard, asking quite quietly for numbers, and when I first saw him I thought he was a woodland sprite. Over the stream and up the steep bank, along the track and keeping an eye for the flag on the left that signalled another steep climb. I will mention my shoes, because I ran on plenty of hard surfaces during this race and they should have been hurting but weren’t. Two weeks ago I’d fallen for the hype around Inov-8’s £140 Graphene Mudclaws. Graphene for the extraordinary lugs, a Kevlar upper. My friend Chris had got a pair and worn them on the recce and kept saying with wonder, “they’re like slippers”. It’s difficult to imagine a pair of shoes built for serious mud and bog and rocks could feel like slippers. 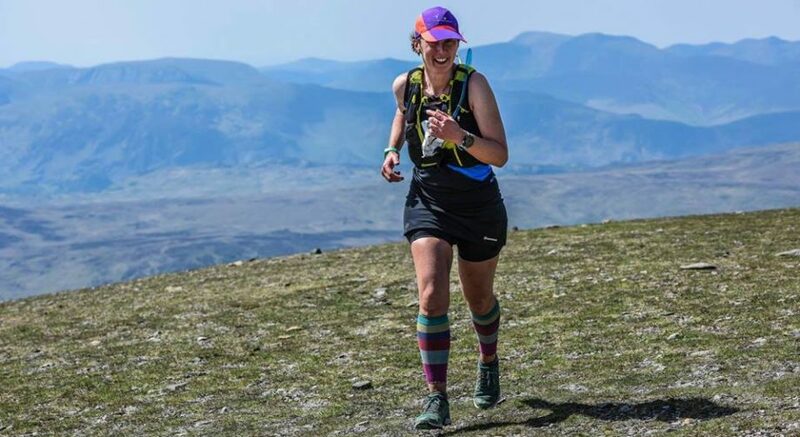 Another friend had got a pair and said she was thinking of wearing them for the Three Peaks because the cleats were so big, they were actually really comfortable on hard surface (of which there is plenty on the Three Peaks route, a race you could probably do in road shoes). I’d only worn mine for the first time the day before on the Vets’ race, and the toe box was narrower than I was used to, and I worried my wide feet would start to suffer. But I decided to wear them, and they were brilliant. I got a sore little toe, but otherwise: superb grip, and comfortable even on hard tracks. Not quite slippers, but not far off. Also I managed to keep them on my feet. 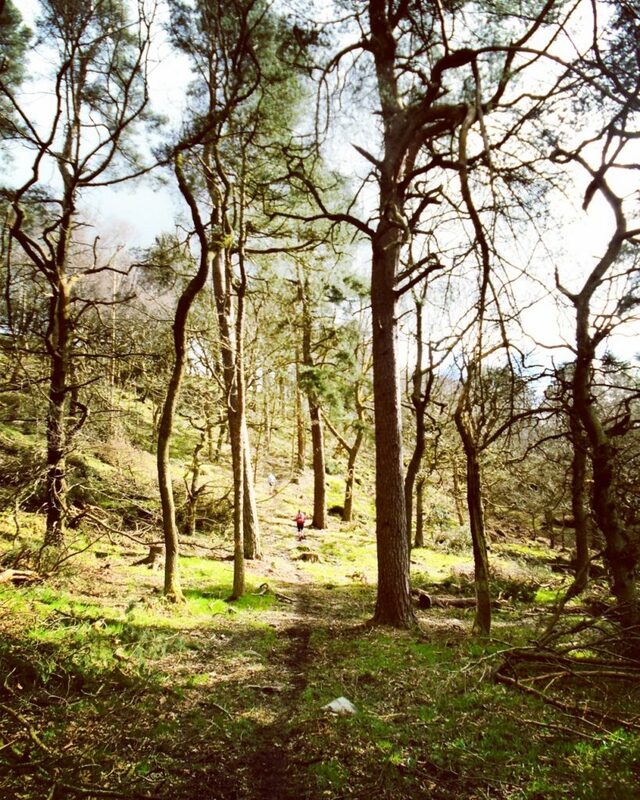 Heptonstall includes an infamous bog, where fell runners have disappeared and not been found for centuries. Not really, but it is deep and it is wide and it is boggy. The official advice had been to sweep round it from the left, but I followed the people in front as they didn’t appear to be sinking and went straight through and it was barely a bog at all. By that I mean, I got wet to my calves but no higher, and I kept my shoes to myself. 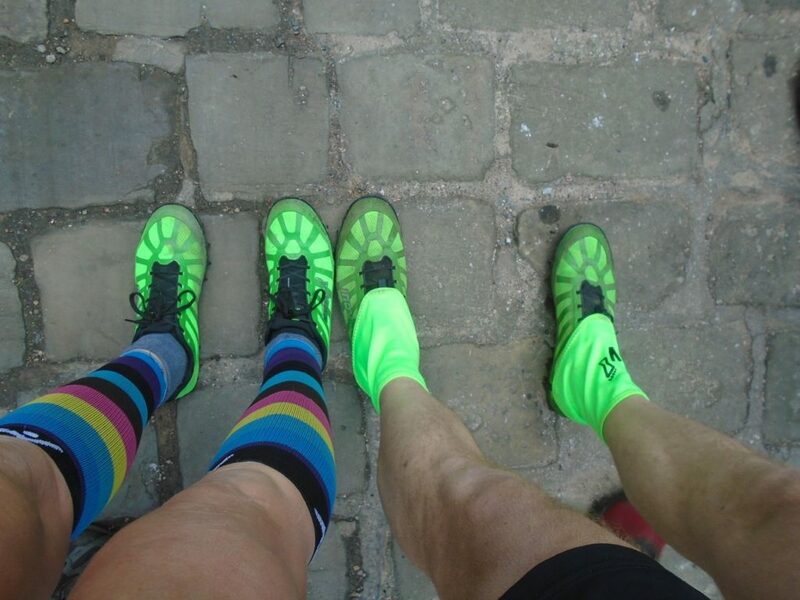 The shoes were a conversation starter too because as I went over a stile somewhere or other someone behind said, “are those the Graphene Mudclaws?” and we struck up a conversation and stayed talking more or less for the rest of the route, finishing together. Nice to meet you Nick. Me: I hope you’re warm enough. Me: There’s not a lot I can do about that. Sorry. The weather: the forecast had been for 10 degrees, not too much wind. But this was the proper tops. At registration, the air was biting, and FRB, as hardy as they come, was questioning his choice of bringing only a vest. I ran in a vest and long-sleeves and I was fine. Afterwards he said he was fine too, but he has more body hair than I do. Something odd happened in the last few miles: I got better. I overtook people, including Aileen (this rarely happens). And I still felt good, and my legs still moved by themselves. The final mile is particular. You run along a beck, along a conduit, and then reach the Stairs of Hell. I hadn’t had to climb these last year because I’d got lost way before then. And in 2017 it was pouring so hard all the way round, the stairs were a relief from the weather, no matter how steep they were. (They’re actually steps not stairs but by the time you are halfway up you won’t be thinking about vocabulary except the swearing kind.) They are definitely steep, but they passed soon enough. And I knew that what was to come would feel harder even though it wasn’t, because there were two fields to get up on exhausted legs, before the finish field. Heavy legs and grass: it’s funny how many race organisers end their races with that sapping combination. But the inexplicable strength continued, and I ran where before I would have walked, and then there we were at the finish field, and I’d had such a nice time that I didn’t even mind seeing all the dozens and dozens of people quicker than me who were already strolling back to their cars. But I put on as best a downhill sprint as I could, and encouraged Nick to do the same. Later, some friends said, “we were urging you to beat that man you were running behind”. But I didn’t need to: because he’d been very good company, and because he had arrived too late to register so he was running as a ghost and it didn’t matter whether I beat him or not. I got to the finish, my lucky 13 was cut off me, there was FRB looking fresh though chilly (he’d finished with a superb 15-minute PB in 2 hours 35 minutes so he’d been there long enough to be on his third flapjack). I didn’t know what time I’d done until later, but when I did I nearly fell over although I was sitting down. 3 hours and ten minutes. That is, 24 minutes quicker than I’d done in 2017. My fellow Run Braver Louise had got a PB of 25 minutes, and Izzy had had a storming run on her first attempt. The moral is: structured run coaching is very good for you, and Run Brave is brilliant. I don’t think I ran faster. I think I ran more. Everything that was runnable, I ran. I ran more of the inclines where before I would have walked. I remembered to think about my form and technique and when I did remember, to make adjustments to make things easier: to remember to move my arms when I’m tired, to lift my knees when my legs are knackered, to hold myself high on hills and use shorter strides. It worked. I had a wonderful time. It is a fabulous race route with beautiful scenery, and afterwards they give you flapjack and more food. I’m very proud of myself (even if I did pee my pants again) and conclude that I should now only run races that are blessed by vicars. See, coach, I do have tactics, of sorts.